The Renaissance jewels of Urbino and Ascoli Piceno are situated at opposite ends of the region and are great places to spend a day. The red brick Palazzo Ducale dominates Urbino whilst the Piazza del Popolo in Ascoli Piceno is often described as one of the most beautiful squares in the whole of Italy. Pergola is home to the Bronzi Dorati, a unique group of life size bronze statues on display in the town museum. For a spectacular sight in the natural world, head to the 'Gola di Rossi e di Frasassi' reserve. Underneath the forests, streams and hills of the park lies an amazing 26km network of underground caverns, lakes and crystal formations. 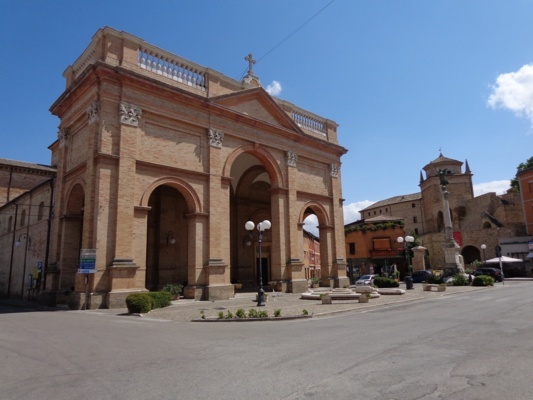 The city of Macerata boasts one of Italy's oldest universities and, with its web of narrow streets surrounded by 16th century walls, is a fascinating place to visit. Due west is Tolentino, sitting on the banks of the River Chienti. A typical Marchigiano town, it is the gateway to the Monti Sibillini. This glorious mountain range, often snow capped, is a stunning backdrop to the undulating landscape. Country roads guide you past hilltop villages and the clear waters of Lake Fiastra to a paradise where outdoor activities, such as rambling, mountain biking, rafting and bird watching can be enjoyed. Further south are fashionable and bustling coastal towns with palm-fringed sandy beaches, and great seafood restaurants. Further north up the coast, the Conero peninsula offers an alternative picture, its blue-flagged beaches backed by protected pine forest and wetlands. 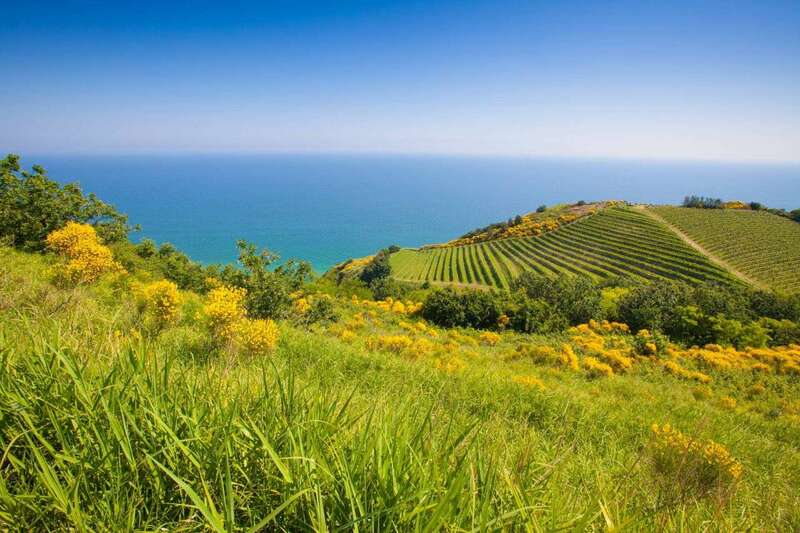 The food of Le Marche is influenced by both its coastal and rural areas. Platters of meat, grilled on embers, are served in the hinterland whilst dishes of freshly caught seafood are the choice in any seaside restaurant. Truffles are also found on the menu – the town of Acqualagna is one of the most important centres in Italy for truffles. Le Marche produces its own dry white wine known as 'Verdicchio'. Or for those who prefer red, the ones to note are the Rosso Conero wines produced on the slopes looking over the Adriatic. Le Marche plays host to a number of summer festivals, many of which focus on music. Two notable opera events are the Rossini Festival held in Pesaro every August, and the Macerata Opera Festival which takes place in a huge open-air stadium between mid July and mid August. 'Sagre', festivals centred around a particular food, are commonplace. For example, Cossignano holds two in August: the Festival of Fish and the Festival of Sausages! In Montalto delle Marche in mid August, the whole community is involved in the Festival of Fairies and Witches and the town is transformed into a fairy tale world of fantasy based on tales from children’s books. Fermo hosts an array of events over the summer including a big music festival, and the Feast of the Holy Thorn in mid-August, when more than 1000 people dress in 15th century costume. Further north, Amandola plays host to an International Theatre Festival during the first week of September, in which the whole town takes part. Spring is a wonderful time to stay in Le Marche: wildflowers carpet the meadows, the air is fresh and the temperatures ideal for days spent sightseeing or walking in the mountains. Summer is hot and dry, with temperatures often exceeding 30°C. This warm weather often remains into September, prolonging the summer. Towards the end of the September and into October, autumn arrives and the air becomes crisper. Ancona airport is closest for our Le Marche properties, with Pescara, Perugia and Rome also in reasonable driving distance. This hilltop town, perched in the upper valley of the River Aso, has a good selection of restaurants and shops. Its elegant centre is due mainly to the efforts of Pope Sixtus V, who trained as a priest in the village and hoped to turn the little village into an important Episcopal See and his ‘perfect city’. A monument to him stands at the entrance to the town while the picturesque streets beyond are lined with hundreds of lime trees. Be sure to visit the market here on Wednesdays, held under the shade of the famous limes – a friendly event with plenty of bargain shoes and linens on sale. In mid August, around the 14th or 15th, the whole town comes together for the Festival of Fairies and Witches which is a fun event for all ages! Nearby Offida is listed as ‘one of the most beautiful villages in Italy’ and famous for producing delicate lace and high quality Rosso Piceno wines. And, with the coast only about 30 minutes’ drive away, and a similar time to the spectacular Sibillini mountains in the other direction, Montalto is well placed to enjoy both settings.